Yesterday I received another rejection for my novel Border Line. They are stacking up nicely now. Last night I found an email from a friend. The subject line read: did you write this??? or where did I HEAR IT? This is a quote from Border Line, which my friend must have read well over a year ago. He may have remembered the line because he hated or was irritated by it, BUT at least he remembered it. He may even have liked it. I have to hang on to all forms of encouragement. 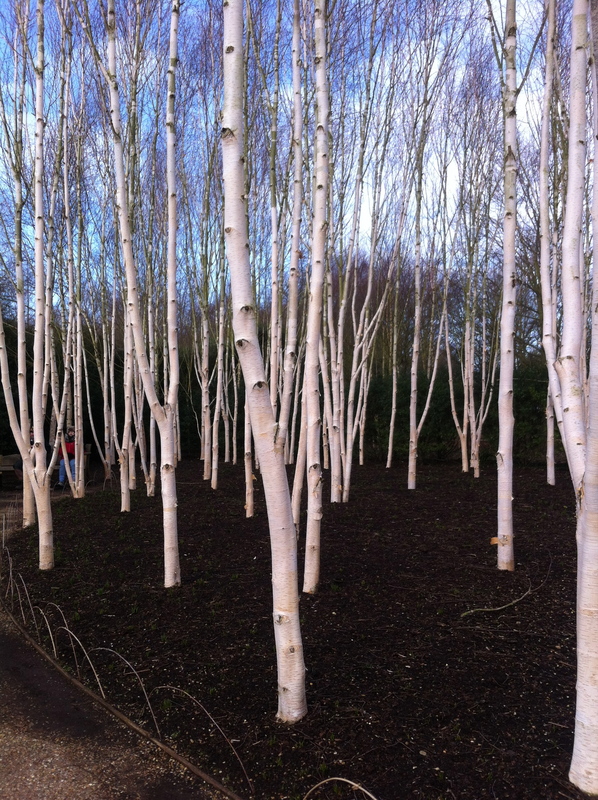 Birches in Anglesea Abbey gardens Winter Walk today. This entry was posted in Gardens, Writing notes and tagged Anglesea Abbey, border line, Literary agents, rejections, silver birches, submissions, writing by hilarycustancegreen. Bookmark the permalink. Editors should have been prisoners of war… They would understand the importance of this subject. This was my novel, Pierre, not the POW book. I did submit that to a publisher before Christmas, but haven’t had a reply yet. After about 6 weeks, you have to assume they will not be bothering to respond at all. Oups… You can delete my comment then. I don’t understand, what could they be thinking? This is not the POW book (see above). And as my novel has the uninviting USP of being an upbeat novel about suicide, I sort of know what they are thinking. Ahem, Romeo and Juliet had 2 suicides in it. Shoot for the moon, you might land on a star. Keep trying. Keep believing in your work. Keep sending it out. Rejections are difficult. Even brutal. They break our hearts and fill us with discouragement. And it takes a lot of energy and courage to get back up on our feet. But that’s part of what being a writer is about. So true. Fear not, I’m not the giving up type and I have been lucky in publishing (in a very small way) a couple of novels already. It is very comforting, though, to be able to share the momentary downs with others who understand. Well, the birch tree photo is lovely. Thank you for that shot. I remember a birch tree forest near where we lived in The Hague. That was back in 1956. A long time ago! I remember. The trees were dreamy, so was the sunshine and the other areas of planting just designed for winter. Particularly as I am keen to read it. I think it is such a fine line between acceptance and rejection – many of the greats have been rejected several times and then fate decides otherwise. I suspect I would never have anything accepted for commercial use. I edit and refine almost constantly – not for my blog but for another site where I contribute. I would never finish a book. I like the birches very much. I planted them in my garden many years ago. I tore out the previous owner’s conifers and planted alders, dogwoods and birch trees. So much nicer! I am still editing/refining. I don’t think you’d ever stop unless you were deluded about your skills. I realise that I have planted six different birches in my garden. They are such gentle trees, letting plenty of light through. The birds on the feeder outside my window hang out in the birch tree nearby. I shall do the same; quality matters. I have done this once before in 2008 and there is a lot to learn (and it has all moved on). I managed to do better than break even, so I am happy. The downside is that being a publisher is time-consuming, hard work and, personally, not where my skills lie. Still, we are lucky to have the choice. Great, we’ll squeeze the Atlantic between us. Two things I learnt too late last time; reviewers/magazines aren’t interested in a book that was published more than 3 months ago, beg borrow or steal a quotation/strapline from someone in the field, for the cover front and/or back. Good luck! If they turn a novel down do they give you a heads up why? Not if it was a ‘submission’ i.e. a letter a synopsis and the first 30 pages of text. If they have asked to see the whole manuscript and then turn it down, they usually give a hint, e.g. not enough momentum, or the main character not sufficiently engaging, or simply they could not feel passionate enough about it. Hilary, I felt as you when I read this. While I am unable to completely feel as you did, the feeling of rejection is not nice at all. But your walk near the beautiful birches…was a great step forward, was it not? Thanks, Koji, I am lucky in so many other ways that the rejections are not too big a deal, but it’s nice to share and get some sympathy.